Event annotation is fundamental to understand the data recorded better, to identify periods where the changes in the signals were provoked by non-physiologic data, effects of therapy and others. 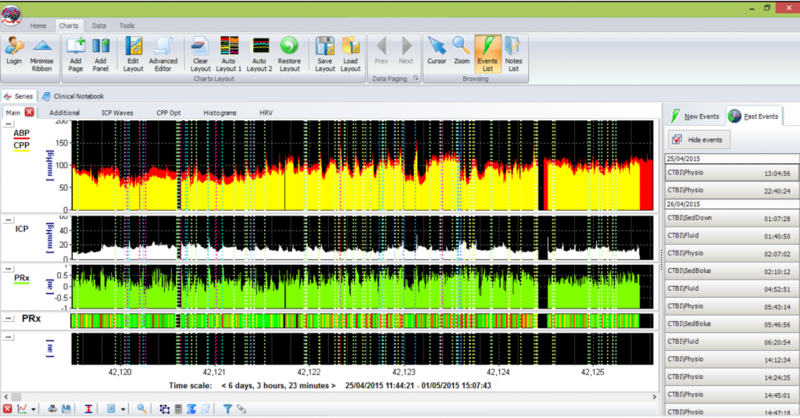 ICM+ provides the means of adding this extra information to the recordings, both in real-time and retrospectively. At the moment ICM+ has 2 versions of the event form, the first one is a generic one that will have a great collection of events all ordered in groups (1). This version of the form is not specific to any condition and will contain events to many different conditions. To navigate through this form, you will have to choose the theme that the event you want to insert is in (1), then choose the event from the list (2) and add the event specific parameters (3). This form of adding events is very flexible and if used properly will generate recordings with extremely detailed annotations, but due to the difficulty of its use, it can realistically only be used in a retrospective way. In order to allow for real-time insertion of events at the bed-side, we have developed a new form. This form is composed of 9 buttons, each representing a different event that can occur during the data acquisition process. This form is meant to be used by the clinical staff at the bed-side to document all the listed events as they occur. 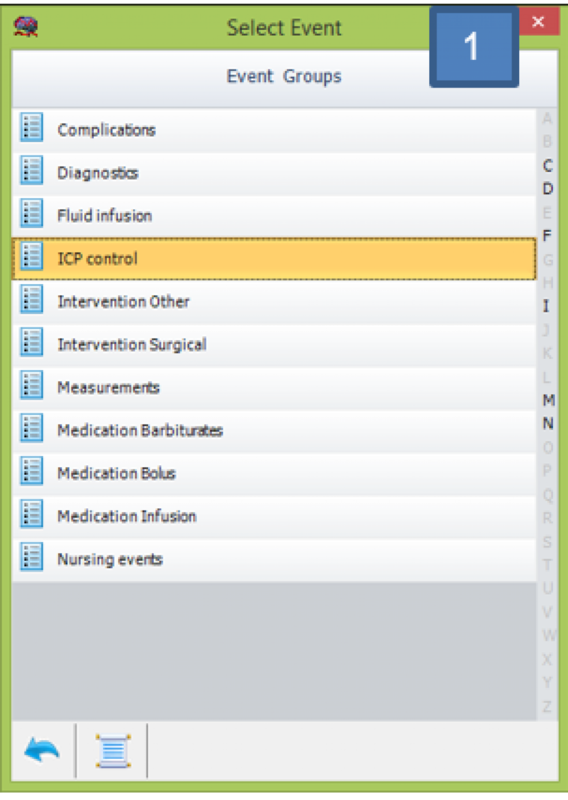 This form will present the nurse with a summary of the selected event and if everything is correct the confirm button needs to be pressed in order to store the event. 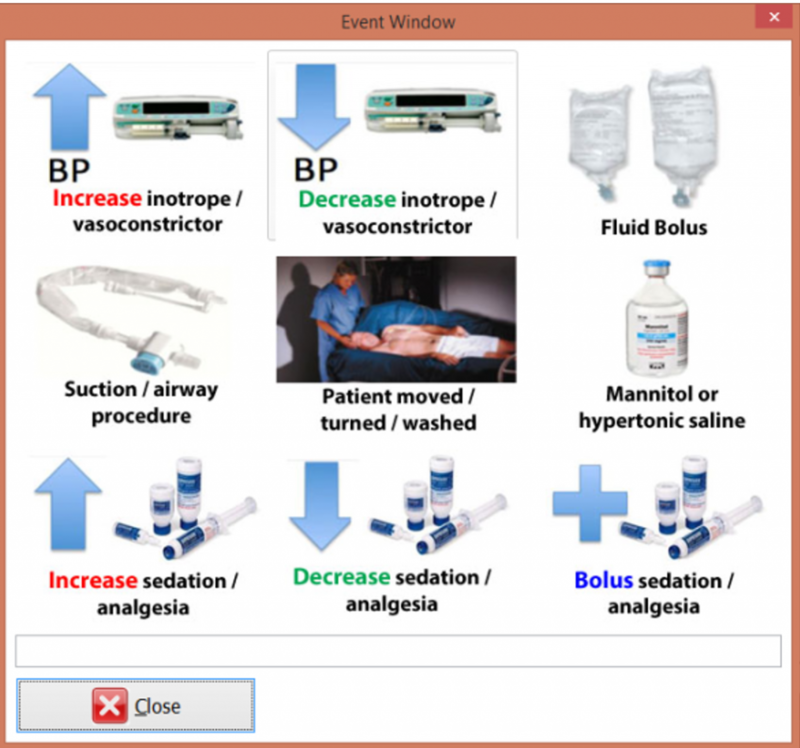 This from will allow the user to edit the time of the occurrence if something prevented the nurse press the button immediately after the event occurred. It is also possible to add a comment to the event if needed. If the event is not confirmed during a given time window it will automatically close, but this should be avoided as much as possible as the event will be stored as ‘unconfirmed’. After the confirmation or cancelation of an event this window will close and the Event Window will come up again. The event window can always be closed if, for example, the doctor needs to browse through the application to browse through the charts and clinical notes.